A few months ago, we introduced API key permissions to limit access and minimize risk of compromised credentials to your SendGrid account. This is just one of several security features we have launched over the past year. Today, we are taking our dedication to security one step further with IP Access Management. 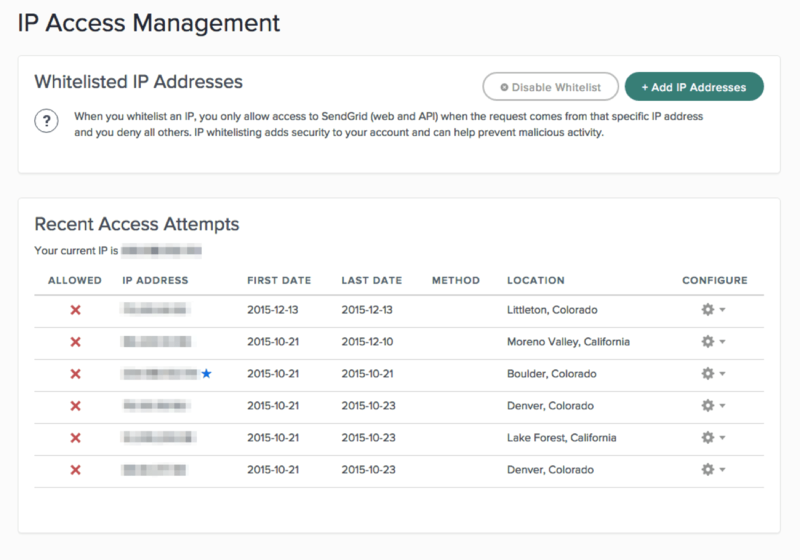 Also called IP whitelisting within the industry, this feature allows SendGrid customers to specify which IP addresses can access their SendGrid account. See a log of your IP access history—enabling you to view all of the IP addresses that have accessed your account. Set up rules specifying which IP addresses and/or IP ranges are allowed access. Help protect your account from unauthorized access. We’ll even send a notification alert when an unauthorized IP address attempts access. Available to all SendGrid customers, no matter your sending volume, we encourage all of our customers to implement IP Access Management today—adding another critical layer of protection to your important emails and data. Get started! Set up IP Access Management by following the instructions in the documentation or by managing your IP access in the Customer Portal.